No, no, no, no. This post is not sponsored by Red Lobster. I just know that we all have a little seafood lover within us just waiting to get out. Amirite? Happy Friday my darlings! What is in store for the weekend? I bet you can guess what I have planned. No. Not a trip to Red Lobster. Packing! Tres chic. Anyway, as we all gushed about garden soirees earlier in the week, I obviously have outdoor events on the brain and what better food to serve in an outdoor setting than seafood. Crab boils, hushpuppies, shrimp boil kebabs, crabcakes and coconut shrimp. Serious seafood. 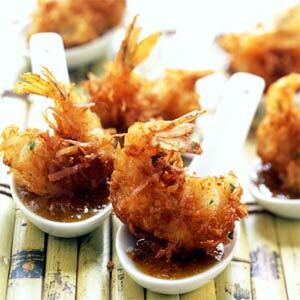 I have compiled the best of the best seafood recipes that will leave you with the below aftermath. Which means, great success. 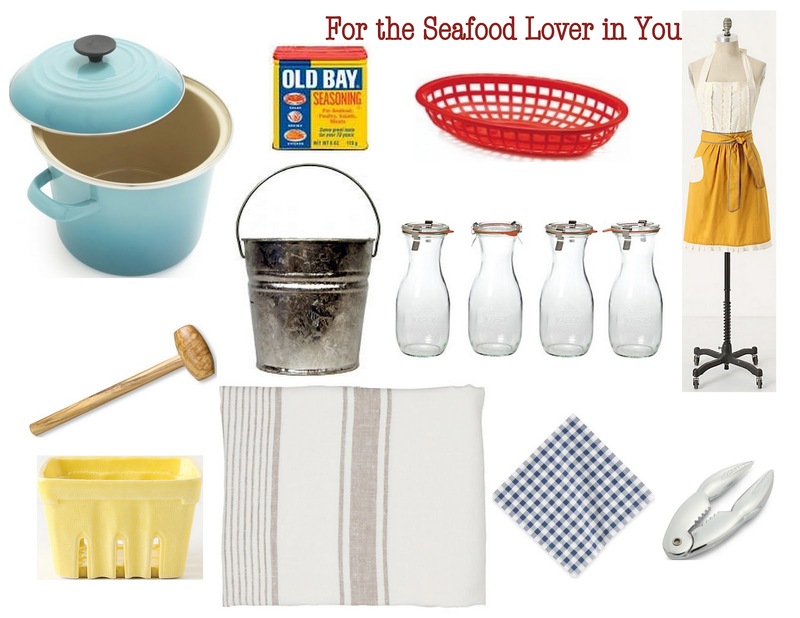 And for all of you who are jonesing for seafood like I am, here are the tools to get you that seafood soiree that we are all desperately wishing to throw. Don't forget the butcher's paper/newspaper. You will thank me later. that is what summertime in Charleston is all about! Some of my favorite things! LOVE THIS!!! I miss Lowcountry boil parties. I think we need to get Richmond on board with the program. And some crabcakes. This is the best post I have ever seen. Seriously. Mmm old bay. What a great post idea! Ive always wanted to go to a real crab/lobster/clam bake. We don't have those on the west coast and I don't know why? Love seafood, I'm with you! Ohhhh my mouth is watering!!! I love seafood!! 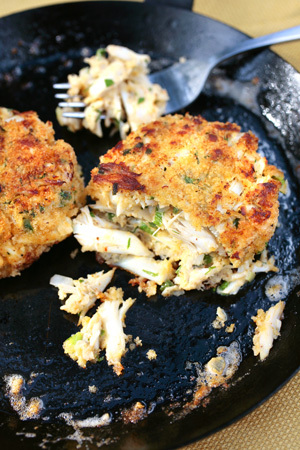 How good do those crab cakes look!?? Oh my my my!!!!! Yummy!!! Sam! I totally wish! Packing up our entire house for the big move in T-12 days. What kind of progress have I made? Wait for it. 2 boxes. Oy vey. 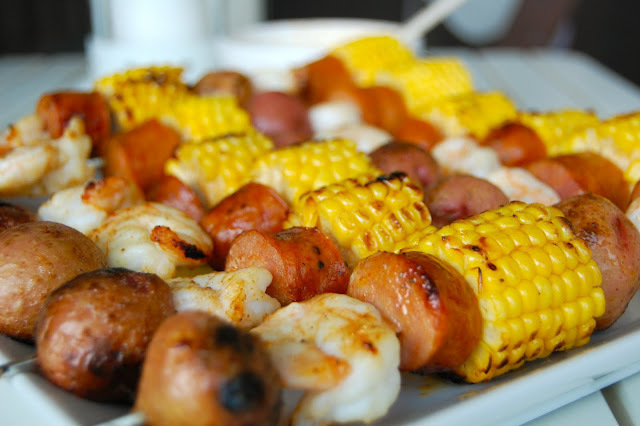 Those shrimp boil kabobs look ah-mazing!! Oh my!! Might be a seafood kind of weekend! Oh my goodness seafood always reminds me of summer! And I love all of the fun accessories! Eeek, just went to an oyster roast 2 weeks ago and it was TO DIE FOR!!!! 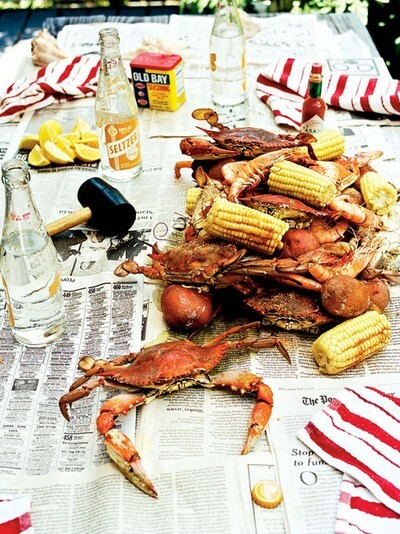 What a great idea and definitely on my list to host a clam bake/crab boil/oyster roast this summer!! Happy packing and have a lovely weekend! I think you forgot the best sort of seafood boil that exists.....a Louisiana crawfish boil! You need to teach me!! I love a good crawfish boil! Being from Maryland crabs are my weakness! That first picture is like heaven for me! 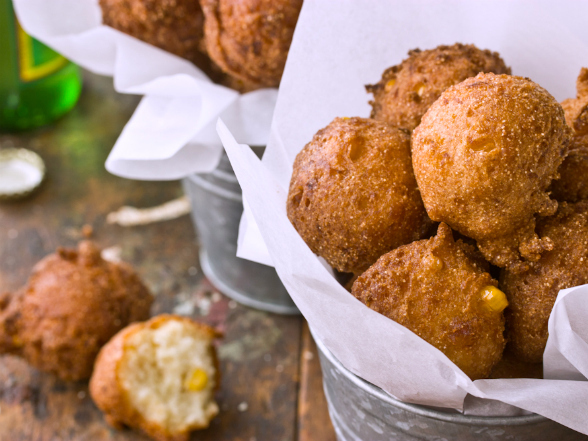 Hushpuppies are amazing too with some honey- yum!